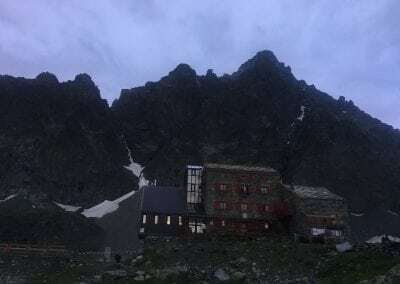 Monte Viso towers above the Quintino Sella hut, far bigger and impressive than the gentle surroundings would suggest. At 3841m Monte Viso is actually pretty high in terms of attitude, and a little prior acclimatisation would probably be useful. 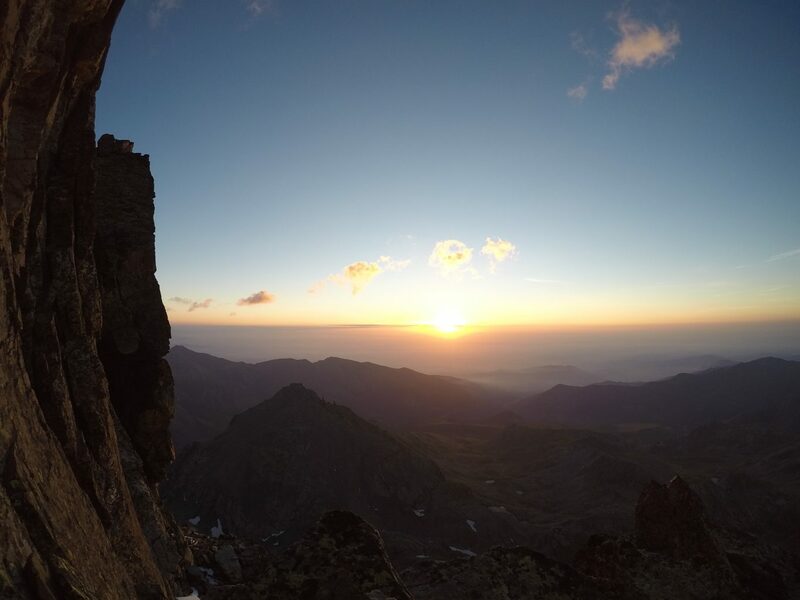 The East Ridge starts close to the Quintino Sella refugio, and is an impressive and long route. 1200m in height gain over a mixture of solid and loose rock with short sections of harder climbing, but a lot of easier scrambling typically climbed by short roping or moving together. In terms of physical effort, and technical difficulty it feels very similar to the Matterhorn's Hornli ridge. 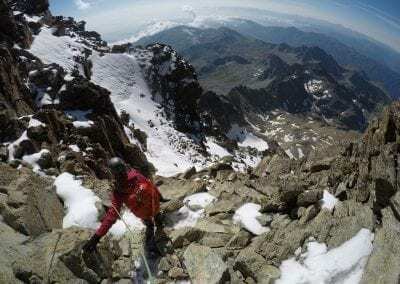 And the east ridge of Monte Viso offers a great alternative to that mountain when the weather in the western alps is unsettled. One noticeable difference with this mountain is the crowds. 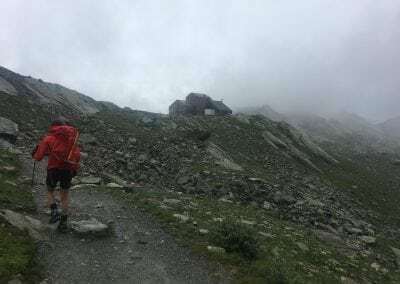 There are plenty of people out walking and a few on the normal route but compared to Swiss 4000m peaks it is deserted. After circumnavigating the lake outside the hut, some scree walking leads to a small snow field coming from the gully boarding the ridge. Crampons and an axe are useful for a few minutes, to gain access to the east ridge. The ridge is followed, with some small towers or steeper sections avoided on the left (south) side of the ridge. Patches of snow exist here into the summer, and an early season ascent could involve climbing in crampons. Higher up there is the optional tower Robert, and not long after the route splits and it would be possible to escape sideways to the normal route, but the summit is not far away at that point. Descent is by the normal route, itself a long PD ascent and looping walk/scramble back to the Quintino Sella hut. Intermediate. A high level of fitness and solid crampon and scrambling skills required. A similar level to the Matterhorn. 1200m from the hut to summit. Drive and approach (2.5 hours) to Quintino Sella refugio. 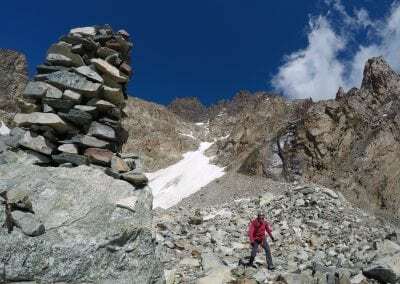 Climb east ridge and descend to Quintino Sella or Giocoletti hut. Optional climb in morning and then walk to car. For the route itself, guidebook time is 5 - 8 hours. 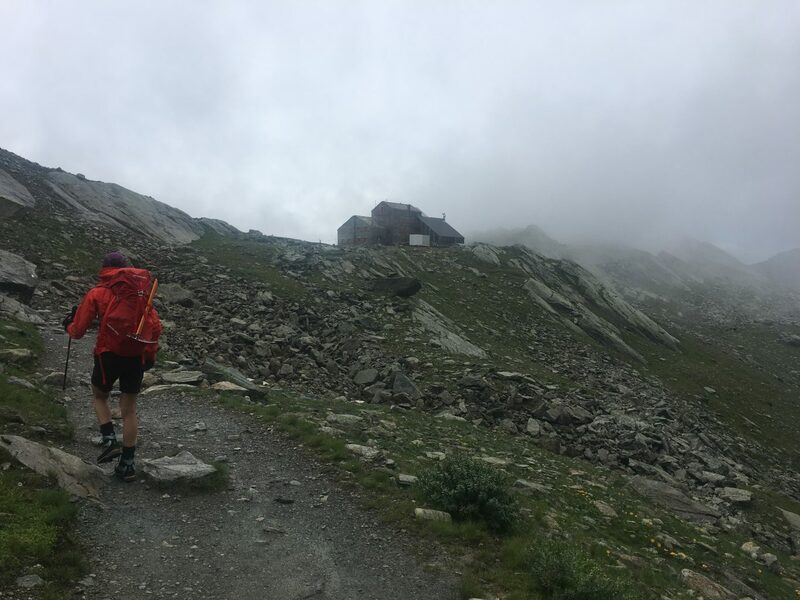 The descent of the normal route is then 3 - 5 hours back to the hut. 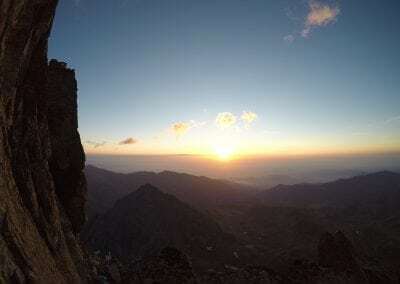 The surrounding peaks in this area offer a high variety of rock climbing and mountaineering routes, and a three or four day trip in this area allows you to sample some of the other climbing, or warm up for the East ridge.